SOPHE’s board of trustees adopted a new resolution, Improving Lives through Health Education on Opioid Prevention & Treatment, which documents the latest evidence on the epidemic and outlines health education steps to address opioid addiction and treatment. This resolution includes actions SOPHE is taking to provide an evidence-based approach to the opioid crisis. Refer to A Primer on Opioids: The Critical Role of Health Education in Preventing Addiction and Saving Lives to understand the basics about opioids and the health education approach to the opioid epidemic. SOPHE’s policy brief explores the U.S. opioid epidemic and advocates for a broader role for health education in prevention strategies to stem the tide of opioid-related deaths in the United States. For the latest health education literature on the opioid epidemic, use SOPHE’s Opioid Bibliography: Resources for Public Health and Allied Health Students, Professionals and Faculty. 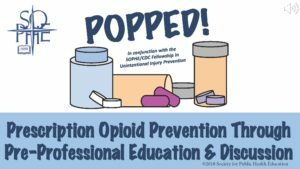 A new curriculum also is available to educate health professionals about opioids, Prescription Overdose Prevention through Pre-Professional Education and Discussion (POPPED). Opioids and HIV – hear the recording of national experts Justin K. Phillips, MA, founder and executive director, Overdose Lifeline, Inc.; Carrie Ann Lawrence, PhD, CFLE, CHES®, associate sirector, Rural Center for Aids/STD Prevention, Indiana University School of Public Health; and Shannon Frattaroli, PhD, MPH, Johns Hopkins, associate professor, Johns Hopkins Bloomberg School of Public Health. Also, access the PowerPoint slides that accompany the presentation. Community Readiness to Prevent Opioid Epidemic – read this 2018 research article available in SOPHE’s Health Promotion Practice journal. The goal of this study was to increase understanding of the extent to which communities with varying levels of opioid misuse and overdose are prepared to respond to the opioid epidemic. Also view the webinar recording of this article. *Access SOPHE Publications – free for members! Log into your My.SOPHE account and click the ‘Publications’ tab for access to full journal content including articles first published online. Nonmembers can join/renew SOPHE membership. Download SOPHE’s bibliography, Opioid Bibliography: Resources for Public Health and Allied Health Students, Professionals and Faculty, for access to the latest, evidence-based resources to better understand and combat the opioid epidemic.